Columbian government agents invoked Che Guevara to "free" Imperialist running-dog prisoners from the champions of the poor and downtrodden, the Fuerzas Armadas Revolucionarias de Colombia also known as the Revolutionary Armed Forces of Columbia or FARC. Columbian agents disguised themselves as Human Rights workers, even going so far as to wear Che Guevara T-shirts, and employing foreign accents to confuse the FARC'ing freedom fighters that they were there to help facilitate a transfer of the war criminals to place where they would be used to negotiate the release of FARC'ing prisoners held in Guantanamo Bay Columbian Prisons. Gas, grass, or "Kalash" no one rides for free. A pretty FARC'ing good looking soldier. Viva la Revolutione. 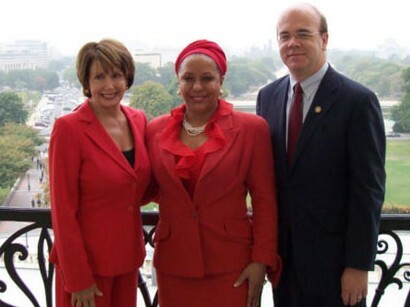 Records illegally siezed also attempt to implicate the People's Hero Nancy Pelosi, Jim (Child Molester smile) McGovern, and FARC'ing heroine, Columbian Senator Piedad Cordoba, in illegal dealings with FARC and Hugo Chavez. It doesn't matter to me the proposal that Sarkozy has made to free Ingrid. Above all, do not liberate Ingrid. Nancy looking chic in her Politburo uniform, non? To make matters worse. It appears that George Bush and John McCain were both briefed ahead of the operation, and that a US surveillance plane provided material support to the operation. Barak Obama could not be reached for comment, but a spokesperson was overheard mumbling "I'm sure we could have gotten a hold of Hugo and stopped this had we known." Doesn't Joe Kennedy have his number in his five? I'm hopeful the United Nations will vehemently censure President Uribe for his cowboy antics in poaching away the only bargaining chips these poor insurgents have for achieving a lasting peace. What fantastic news this is! By allowing the foolish Amirkkkans to think they have "rescued" their compatriots, who have been indoctrinated by our loyal FARC commrades in the field - the populace will embrace them fully ... and perhaps they will be brought into public positions as our hush hush Manchurian Candidate McCain has - he was even there for the event to supervise! Oh, but comrades, there is reason to mourn. Robert Menard of the no doubt progressive Reporters Without Borders has said, "I have to recognize that the strong hand has prevailed. Our insistence on the need to negotiate with the FARC, hoping they would release their most valuable card, was foolish." He has done nothing less than renounce negotiations with terrorists freedom fighters! A progressive agrees that someone other than a progressive has the right to use force rather than appeasement, *sigh*. To overcome my depression, I tried to lift my spirits by rereading the ten objectives of communism, and make myself rejoice that America has implemented most of them, but my heart is too heavy. If you think — do not speak. If you think and speak — do not write. If you think, speak and write — do not sign. If you think, speak, write and sign — don't be surprised. Nancy has shown the Bu$Hitler regime that ONLY she can deal with terrorists, extortionists, drug traffickers and South American politicians. Hail, Nancy!!! How dare these imperialist dogs desecrate the memory of Che by wearing t-shirts w/ his glorious visage. They have gone beyond the pale this time. Because everyone knows that appeasement works!